1) Applications are invited Online from qualified candidates through the proforma Application to be made available on Commission’s WEBSITE (www.tspsc.gov.in) to the post of Forest Beat Officer in Forest Department (EFS&T) in the state of Telangana. iv) The Examination (Objective Type) is likely to be held on 29/10/2017 F.N & A.N. ready while uploading their OTR Applications. 1 Forest Beat Officer Must have passed Intermediate examination or its equivalent. Physical requirements: No person shall be eligible for appointment by direct recruitment posts in the service, unless he is not less than 163 cms. in height, not less than 84 cms. round the chest on full inspiration and has a chest expansion of not less than 5 cms. on full inspiration. WALKING TEST: The candidates selected in the First Step i.e, Written Examination shall be subjected to the test of walking. In case of male candidates, a distance of 25 KM walking is to be completed in 4 hours duration. In case of woman candidates a distance of 16 KM is to be completed in 4 hours duration. The walking test is only a physical endurance test and shall not carry any marks. It is treated as a qualifying test. AGE: Minimum 18 years & Maximum 31 years. The age is reckoned as on 01/07/2017 (Rule- 12(1)(a)(v) of State and Subordinate Service Rules). The Upper Age limit will be relaxed as per Rules and will be calculated on the above lines. N.B. : 1) No person shall be eligible if he/she is less than 18 years of age. How to Apply for Telangana Forest Officer Recruitment 2017 ? All the job fighters who meets the eligibility criteria can apply online for this Telangana Forest Department Recruitment 2017 through the main website. From the home page, find the Direct Recruitment section. Click on that link and wait for some time. Select the post you want to apply i.e. Forest Department Recruitment. Click the Apply Online link available before the post. Fill the online application form, upload required scanned copies of documents. Also pay the required application fee as specified. Finally take a hard copy of your application for future reference. G.O.Ms.No. 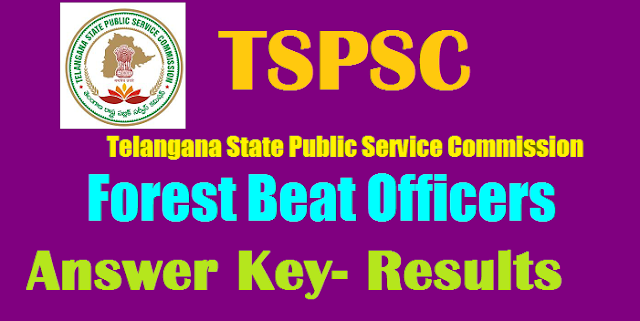 104 Dated: 21-06-2017:TS Govt to fill 1857 vacant posts of Forest Beat Officers by TSPSC. Public Services – Environment, Forests, Science & Technology Department - Recruitment – Filling of (1857) One Thousand Eight Hundred and Fifty Seven vacant posts of Forest Beat Officers by Direct Recruitment under the control of Principal Chief Conservator of Forests & Head of Forest Force (FAC) Department, Telangana, Hyderabad, through the Telangana State Public Service Commission, Hyderabad – Orders –Issued. Read the following: EFS&T (For.II) U.O.No.282/For.II (1)/2014, dt:07.06.2017. Government have reviewed the Direct Recruitment vacancy position in Environment, Forests, Science & Technology Department. After careful examination of the proposal furnished by the Department and keeping in view of the actual requirement of manpower with reference to the nature of work and activities of the department and also the overall financial implications, Government hereby accord permission to fill (1857) One Thousand Eight Hundred and Fifty Seven vacant posts of Forest Beat Officers by Direct Recruitment under the control of Principal Chief Conservator of Forests & Head of Forest Force (FAC) Department, Telangana, Hyderabad, through the Telangana State Public Service Commission, Hyderabad.